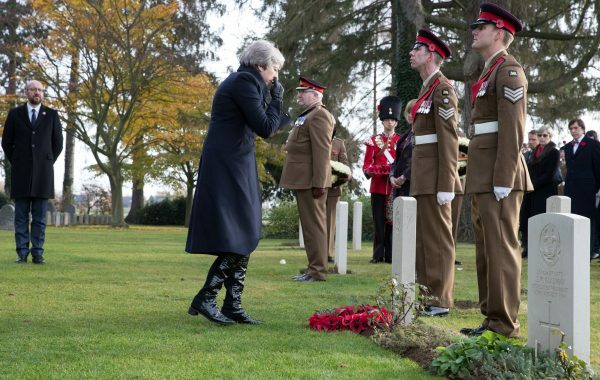 SOMME VALLEY, France—French President Emmanuel Macron and British Prime Minister Theresa May laid a wreath at a memorial in the Somme valley on Nov. 9, honoring fallen World War One soldiers on the eve of the centenary of the war’s end. To commemorate the 100th anniversary of the end of the war this weekend, Macron will welcome world leaders including U.S. President Donald Trump, German Chancellor Angela Merkel, and Russia’s Vladimir Putin. Macron then hosts an inaugural Paris Peace Forum, which Trump will not attend. At Parr’s grave, May left a note: “In that rich earth a richer dust concealed,” words taken from a sonnet written by Rupert Brooke at the start of World War One.